From Steven Vannelli, CFA: Yesterday, someone threw in the towel on EM bonds. The Van Eck JP Morgan Emerging Market Local Currency Debt ETF (EMLC) is the largest and most liquid vehicle to invest in emerging market local currency bonds. In one trade yesterday, someone pushed through a block of 18,841,690 shares, valued at around $320M. Interestingly, the price only fell 1.5 cents on that volume. In the chart below, I show the price and volume for the EMLC over the previous five years. Yesterday’s action is extreme by any metric. For an ETF that normally trades around 3 million shares per day, this was an explosion of 10x the normal daily volume. 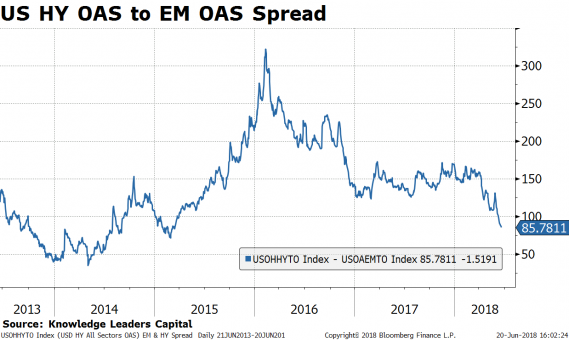 Both US investment grade and EM spreads have been widening recently as oil prices consolidate. 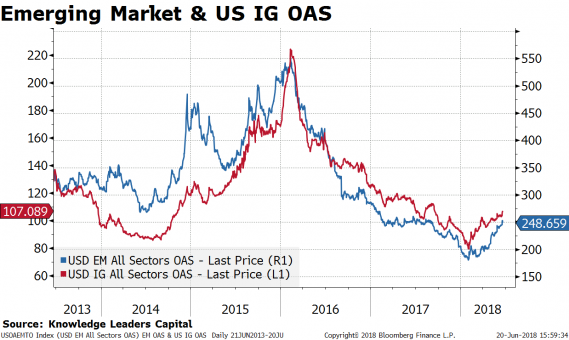 The funny thing is that US high-yield spreads are mostly sideways over the last few months. 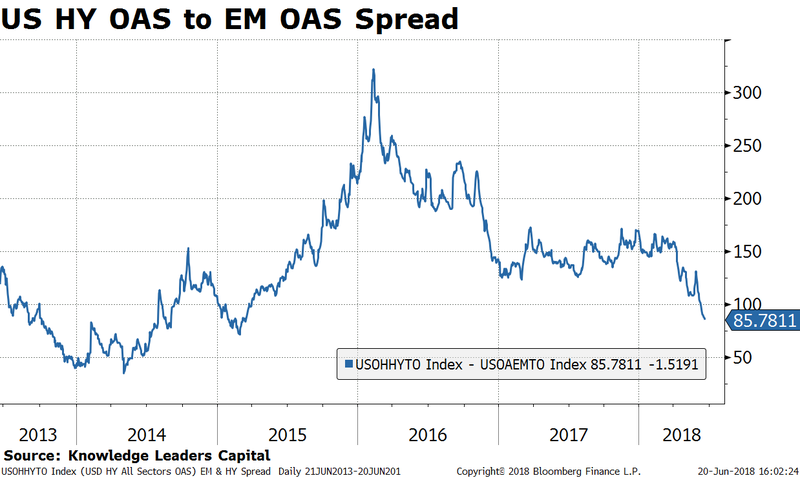 This has resulted in a huge compression in the spread between US HY OAS (high-yield option-adjusted spreads) and EM OAS. This spread is now the narrowest it has been in over three years. After peaking at over 300bps in early 2016, the relative spread is down to just 85bps. 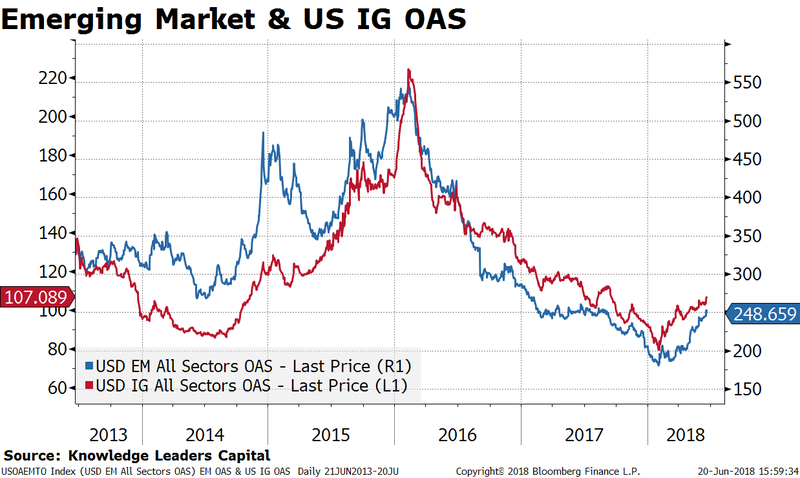 Not only has the spread between EM OAS and US HY OAS compressed, but there has not been any sort of meaningful volume pick-up in the iShares iBoxx High Yield Corporate Bond ETF (HYG). In the chart below, in the top panel, I show the relative price of the EMLC to the HYG (indexed) over the last five years. The EMLC is making a relative low. In the second panel, I show the explosion in the volume of the EMLC. 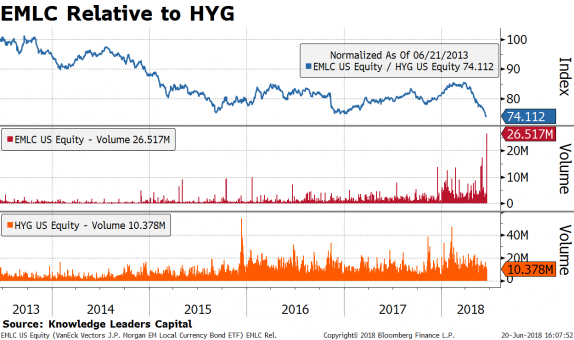 In the third panel, I show the volume of the HYG. 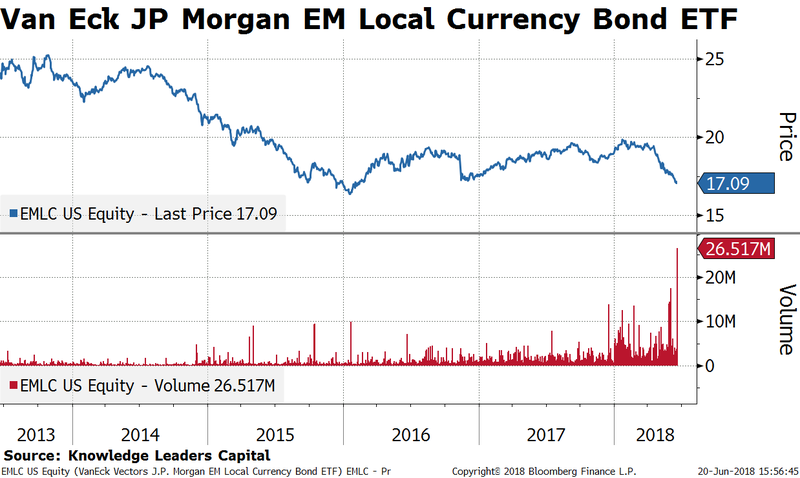 While confidence is rising high for US high-yield bonds, yesterday sure looked like a capitulation in EM bonds. The iShares MSCI Emerging Markets Indx ETF (EEM) rose $0.61 (+1.40%) in premarket trading Friday. Year-to-date, EEM has declined -7.75%, versus a 3.18% rise in the benchmark S&P 500 index during the same period.